Cheim & Read is pleased to announce an exhibition of painting and sculpture by the collaborative duo McDermott & McGough. Their last show with Cheim & Read was in 2006. A full-color catalogue accompanies the exhibition, with an essay by Wayne Koestenbaum. David McDermott and Peter McGough, born 1952 and 1958 respectively, both attended Syracuse University in the 1970s. After meeting in New York in the 1980s, the duo became known for their self-immersion in the Victorian era, in which they lived, dressed and made art according to the limitations of the early 1900s. Paintings, installations and photographs were fueled by this self-imposed time travel; the techniques, subjects and styles used were unique to the period. In creating work that reflected a different era and by reconstructing imagery from the time, McDermott & McGough in turn questioned chronological boundaries of art history and provoked issues of sexuality and cultural identity in an artistic output otherwise defined by its genteel appearance. In their 2006 exhibition with Cheim & Read, titled A True Story Based on Lies, McDermott & McGough explored 1950s American suburbia, using pop imagery from post-war advertisements and comic books to explore a subtext of homoeroticism and domestic tension in otherwise banal mid-century archetypes. In their current exhibition, Because of Him, McDermott & McGough continue their investigation of twentieth-century pop culture, this time focusing on female screen icons of the 1960s—Susan Hayward, Lana Turner and Claudia Cardinale among them. As Wayne Koestenbaum notes in his catalogue essay, "M&M have shattered the mirror of their captivity within earlier historical modes…and are now stepping into Pop." The new exhibition includes several photo-realist paintings of carefully selected movie scenes in which a dramatically framed actress is central. The paintings are composed of two separate scenes from different movies, one black-and-white and one color, stacked horizontally so that one scene seems to bear weight upon the other and a new relationship or narrative is formed. The strong female protagonist of each frame conveys the scenes' emotional impact, and the inevitable nostalgia of McDermott & McGough's selected imagery lends a sense of cool introspection. The sensibility of the large scale, horizontally-composed paintings are echoed in a series of eight photo-realist paintings of 1960s era televisions, the distinctly boxy but individually unique exteriors framing single black-and-white scenes, the actresses' expressive faces filling the screen. One powders her chin; another gazes with detached sensuality at a male, off screen, whose hand extends to light her cigarette. Painted with technical acuity, the works in the exhibition rely on their photo-realist rendering to convey conceptual and formal issues at play. The moving image, especially significant with the introduction of black and white T.V. and, subsequently, color movies, was a defining medium of the early 1960s. McDermott & McGough reproduce single frames of moving film on two-dimensional surfaces of painted canvas, thus freezing the image's original identity and repositioning its impact. The exhibition also hosts a complex installation of mirrors, positioned around the front room at different angles, and a sculpture, placed within the mirrored space, of a cardboard Campbell's soup box filled with romance-themed comic books but carved entirely from wood. As with the photo-realist paintings, traditional technique and medium—carved wood—is used to create an "image" separated from its origin, and supports a Pop Art sensibility. Things are not necessarily what they seem: paintings look like movie stills, wood resembles cardboard, and the characters on screen are not the actresses' true identities. 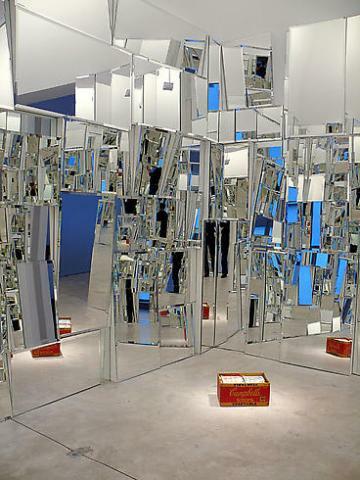 The mirror installation, a cubist study of fragmentation, refraction and reflection, links the themes of the exhibition together, and enforces questions of perception, duality, identity, and, further, the narcissistic ideals of an era. McDermott & McGough again appropriate popular imagery of a specific time, reconstructing it for new significance.